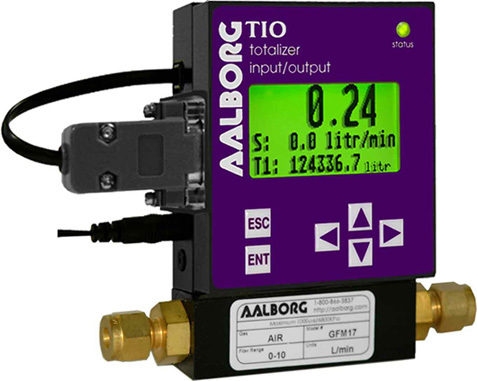 Displays instantaneous, total and accumulated flow rates. Built-in Flow Linearizer (10 point linearization of the flow curve). Up to 47 different volumetric and mass flow engineering units. Large 13mm (0.51") digits for flow rate and 5.5mm (0.21") for Total. Compact design for unit mount, panel mount, wall mount or field mount applications. Two programmable, optically-isolated, digital outputs. Flow controllers, set point command control via local LCD or digital interface. Programmable set point table with ramping up/down capability up to 16 steps. Free Configuration and Monitoring Utility software. For flow meters and controllers with analog 0-5 (5-10) (0-10)Vdc, 4-20mA input output interface, where flow indications / control and to-talizers or alarm functions are required. Also when re-transmission of the flow rate and/or totalizer functions via optically-isolated pulse output or serial communication is desired. Local or programmable set point control for flow controllers (no host PC presence required). 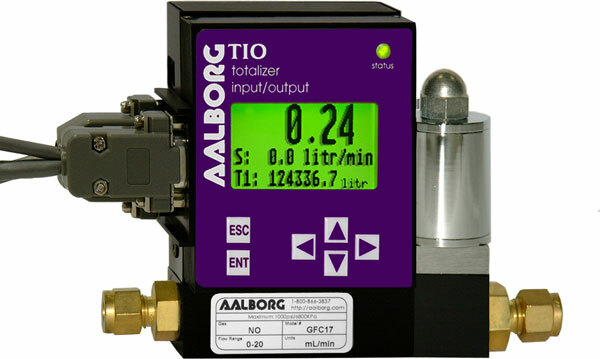 Ac-tivation of user-supplied equipment via programmable optically-iso-lated digital outputs when flow alarms or totalizers events are active. The graphical LCD display has large 13mm (0.51") digits for flow rate and 5.5mm (0.21") for total and can be set by user to simultaneously show different combination of the flow parameters: flow rate, totalizers, flow alarms, and diagnostic events. All configuration parameter set-tings are easily accessed via a simple user-interface menu driven by a 6 button key-pad which can be password-protected. For flow meters and / or flow controllers, TIO provides jumpers selectable for 0-5 Vdc or 4-20 mA analog set point control signals. The flow rate set point can be adjusted lo-cally via key-pad, remotely via host PC using digital communication interface, or pro-grammed in advance using built-in 16 steps batch table with ramping up/down support. The programmable flow pulse output is operating independently from totalizers and based on configuration settings can provide pulse frequency proportional to instantaneous fluid flow rate. 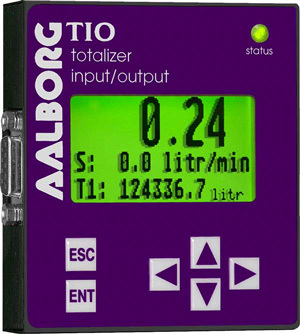 TIO provides two independent programmable flow totalizers. Both totalizers are updated every 100 ms and can be set to activate different events. Main totalizer accumulated total is backed-up in EEPROM memory every second. All process data and settings can be read and modified manually via local LCD Key-pad or through the digital RS-232 or RS-485 communication interface. Proprietary ASCII software interface command set and free Communica-tion Utility software are provided.